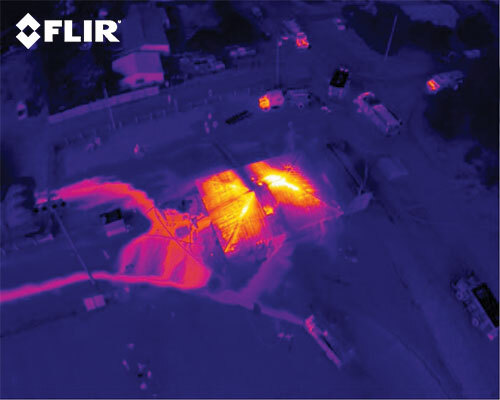 Aerial thermal camera system for the analysis of commercial buildings. Note: this product is available in two different versions. Choose between frame rate of 9Hz or 30Hz using the dropdown box above. Both kits are otherwise identical. The 'R' in this product's title refers to the accuracy of its temperature measurement results. This drone's camera can detect differences in temperature of ±5°C, whereas the standard kit is much less accurate with ±20°C sensitivity. 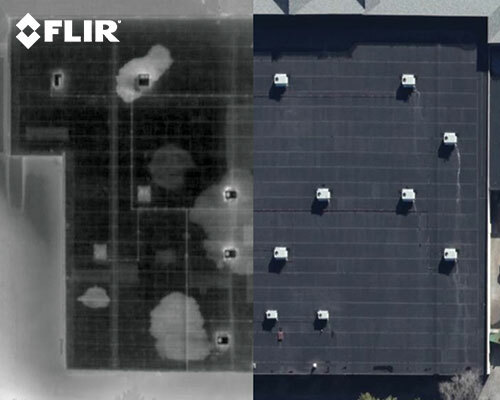 Professional commercial building surveys are now easier than ever before thanks to the power of FLIR's drone technology! Specifically made for inspecting buildings from the air, this package includes both a powerful aerial drone and an equally powerful thermal camera to help you pinpoint structural damage, moisture intrusion and various other building problems without the need to climb ladders, scaffolding and working at strange angles. This product is a joint effort between drone manufacturer DJI and FLIR, the world's leading thermal camera manufacturer. Inside you'll find everything you need for surveys including a DJi Inspire drone, Zenmuse XT thermal camera, a Zenmuse X3 4K visible light camera, an Apple iPad Mini 4 for control, free FLIR Tools software, monitoring hood and much more! This aerial inspection drone uses exceptional flight stability, gimbal technology, mobile app integration and image transmission to create the most comprehensive solution for inspecting buildings available on the market. The drone is easy to control, with real-time streaming to a mobile device (such as the included iPad), easy to control and easy to deploy, no matter where you are. Setting up the FLIR drone is simple - just connect the XT camera to the Inspire 1 drone, then launch in seconds. The camera and drone work seamlessly with each other and give the user instant access to DJi's powerful Lightbridge video transmission system, automated Point of Interest, Course and Home Lock, Follow Me and the DJi SDK. The drone can stay aloft for up to 22 minutes, making it ideal for larger inspections, or for use in search and rescue applications. Here are a few examples of the drone in use. Use the drone to see through smoke and guide firefighters on the ground to the best places to tackle a fire before it spreads further. Find lost hikers or accident victims in both day and night conditions. Search smarter and quicker. 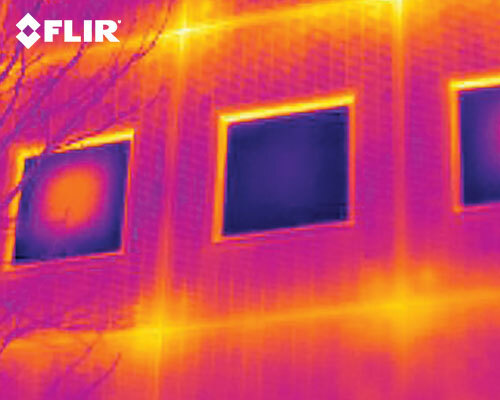 Easily located failed argon gas windows on office buildings. Find invisible water damage in seconds. 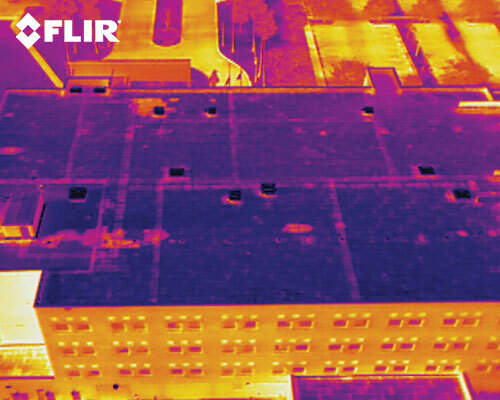 Get a wide-angle view of the whole roof while keeping all the details you need for accurate analysis. Not sure this is the right drone for your application? To help you decide which drone is suitable for you we have prepared a table which outlines the difference between each drone. Please note that operation of the Small Unmanned Aircraft Systems sold by FLIR Systems requires compliance with applicable local regulations, including aircraft registration and operator certification requirements, and may constitute commercial use of a civil aircraft or require coordination with local aviation authorities. Required registrations and certifications are not conveyed with a camera purchase and must be obtained by the buyer. Operator training is strongly recommended in all cases. File storage Micro SD card. 16 GB Class 10 included, up to 32 GB supported. Micro SD card. 16 GB Class 10 included, up to 32 GB supported. 8-bit AGC + LUT video at camera frame rate packaged in either .MOV or .MP4 wrappers. 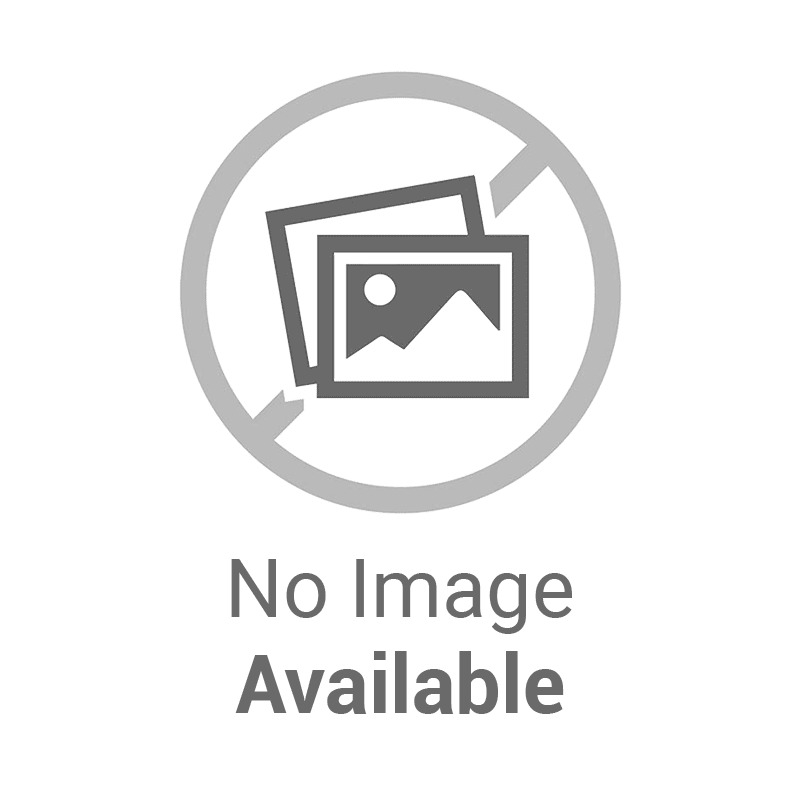 8-bit AGC + LUT still images in .JPG. 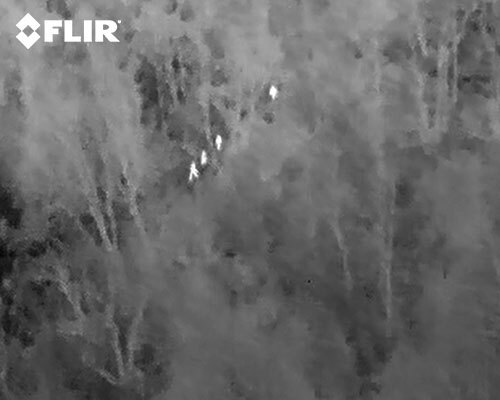 14-bit TIFF raw still images with FLIR-specified metadata. Max. capacity: 64 GB. Class 10 or UHS-1 rating required. Why not leave a review for the DJI / FLIR Zenmuse XT Building Inspection Thermal Drone - Kit R?